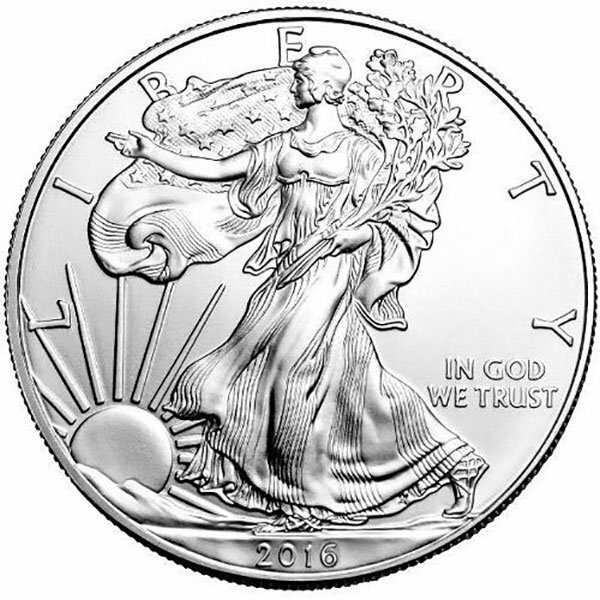 Money Metals Exchange is pleased to offer the world's most popular fine silver coin - the 1 oz American Silver Eagle - with the 2016 date. The US Mint has been minting the American 1oz Silver Eagle, since 1986. Like our bullion coins, such as the Canadian Maple, each American Eagle silver coin contains a minimum of one troy ounce of .999 pure silver. The weight and purity of each one ounce Silver Eagle coin is backed by the US government. At several times in recent years, the mint had to postpone or ration sales of the coin due to high demand! Government mismanagement is part of the reason for the scarcity at times, but that is not the only reason. What makes this coin so popular? Why Buy 2016 Silver Eagle Bullion Coins? Money Metals believe silver coins are generally purchased either as part of a collection, for profit, or as financial insurance. The immense popularity of the 2016 Silver American Eagle dollar make it a mandatory part of any portfolio, and its value is priceless as consideration is paid to what it symbolizes. Other people buy silver bullion coins as a hedge against inflation and in today’s unknown economy, silver coins are an excellent choice of investment. Silver bullion coins can also be held in self-directed individual retirement accounts (IRAs). Although the coins only have a face value of $1, their intrinsic value is a lot higher and dictated by the price of silver at the point of sale, along with the coin’s silver content. Where Can I Buy 2016 American Silver Eagles? Buy your 2016 American Silver Eagle coins from Money Metals Exchange, and not only will you be guaranteed a low price, but you will be conducting your business with an internationally acclaimed business company with more than 7 years in the industry. You can now sell your 2016 Silver American Eagle - 1 Troy Ounce, .999 Pure back to us online, at a price of $16.09 each!